Illustration is self-explanatory. 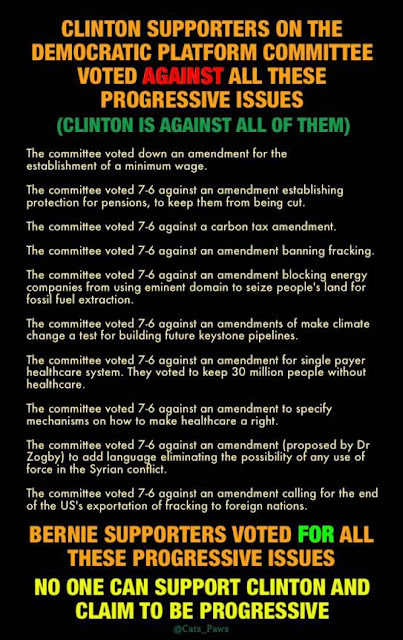 The seven are Hillary's and the six are Bernie's representatives on the pre-convention committee. Arguments in favor of Clinton only hold credibility to the extent that she is not Donald Trump. There is something to this, however. In 1964, there was a choice between Barry Goldwater and Lyndon Johnson. Most felt at the time that they were voting for the peace candidate, but Johnson was responsible for the deaths of thousands of young Americans, perhaps hundreds of thousands of civilians in Southeast Asia. However, it is highly unlikely that the Republican would have allowed the civil rights bill, the voting bill, and Medicare while Johnson accomplished these things to an extent. Still, the illustration explains quite clearly what the problem is with Hillary. 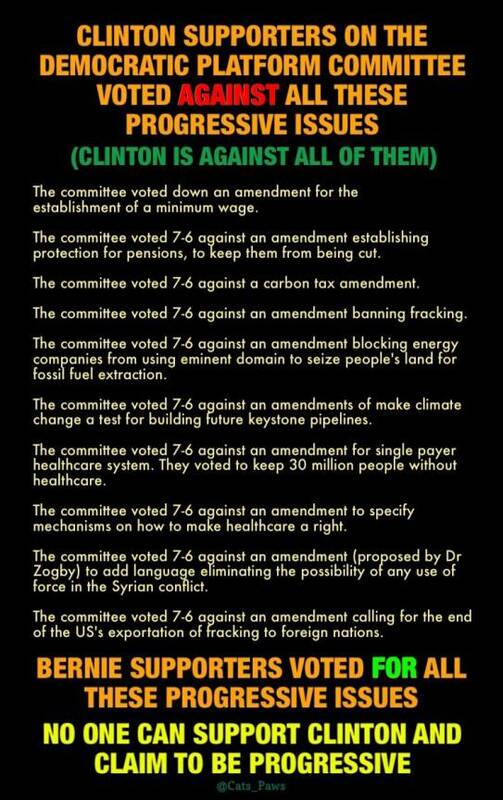 Also, note that all Republican attacks on her have nothing to do with her war mongering. Erdogan sold out to Israel just before the attacks by ISIS at the airport. Apologists point out that such an attack could not be planed so quickly. However, they overlook the fact that many attacks have been planned all over (no, I don't know where), and the participants are simply waiting for an excuse. Funerals have begun in Turkey for some of the 42 people killed in a triple suicide bombing Tuesday targeting Turkey's main airport in Istanbul. The attack also left 239 others injured. Authorities said three attackers arrived at the airport's international terminal by taxi and blew themselves up after opening fire. The airport is the 11th busiest in the world. No group claimed responsibility for the attack, but Turkey's prime minister said the initial probe pointed to the self-proclaimed Islamic State, or Daesh. A senior Turkish official told the Associated Press the three suicide attackers were nationals of Russia, Uzbekistan and Kyrgyzstan. Earlier today, Turkish police raided 16 locations in Istanbul and detained 13 people on suspicion of involvement in the attack. Turkey has seen an uptick in bombings since last year, when the United States began using Turkey's Incirlik Air Base to carry out bombing raids in Syria and Iraq targeting ISIS strongholds. We speak to Koray Çaliskan, associate professor of political science at Bogaziçi University in Istanbul. AMY GOODMAN: Funerals have begun in Turkey for some of the 42 people killed in the triple suicide bombing Tuesday targeting Turkey's main international airport in Istanbul. The attack injured more than 230 people. Authorities said three attackers arrived at the airport's international terminal by taxi and blew themselves up after opening fire. The airport is the 11th busiest in the world. No group has claimed responsibility for the attack, but Turkey's prime minister said the initial probe pointed to the self-proclaimed Islamic State, or Daesh. A senior Turkish official told the Associated Press the three suicide attackers were nationals of Russia, Uzbekistan and Kyrgyzstan. Earlier today, Turkish police raided 16 locations in Istanbul and detained 13 people on suspicion of involvement in the attack. Turkey has seen an uptick in bombings since last year, when the United States began using Turkey's Incirlik Air Base to carry out bombing raids in Syria and Iraq targeting ISIS strongholds. Tuesday's attack came just one day after Turkey restored diplomatic ties with Israel after a six-year rupture. On Wednesday, I got in touch with Koray Çaliskan, associate professor of political science at Bogaziçi University in Istanbul. We reached him at his home byDemocracy Now! video stream and asked him to respond to the attack. KORAY ÇALISKAN: It's really sad that this happened. We know that there is a threat of international terrorism, but unfortunately this threat got materialized more in Turkey. In the last 12 months, we saw 17 bombings that costed the lives of 294 people, wounded 1,009. Not even a single official left office, resigned. And the Islamist authoritarian AKP government did not accept that there was a security breach in Turkey. Remember that these three ISIS terrorists entered Istanbul airport passing a security check with hand grenades, AK guns, Glock guns, and then they entered the airport building after the first security check and began to shoot at people during and after the second check. This is a great problem, and I believe, because Erdogan decided to be a president in a presidential system—as you know, Turkey is a parliamentary regime—they have not been working well to take care of security measures and also take aim at the heart of terrorist organizations. One of the most important sources for open source security and intel, intelligence, is Twitter and Facebook and internet correspondence, right? In Turkey, Twitter is blocked right now. Facebook is blocked. We can't talk to each other through Twitter. We can't talk to each other through Facebook. Why? Because the government and Erdogan himself do not want people to criticize them, criticize their weakness. I'll give you another example. We had another unfortunate bombing in Brussels a few months ago, you would remember. It took Belgian authorities to open the airport six days, because they studied every security breach in that airport and fixed them and opened the airport. Six weeks—six days, excuse me. In Turkey last night, only six hours after the bombing, despite the unacceptable security breach in the gates of the airport, the government decided to open the airport. It costed 41 lives. Not even a single elected official resigned or forced to resign. Nothing really works in this country. The economy is going bad. Democracy, we lost it. Technically, Turkey is a competitive authoritarian regime ruled by Islamists, authoritarian Islamists. In terms of security, you see what's going on. No one really feels secure in this country anymore. And because of the Kurdish question and the increasing terrorist activities of PKK, the government doesn't know what to do, other than bombing people, other than using military means, other than shutting down Twitter, other than doing what authoritarian leaders do, from North Korea to Syria, from Russia to Turkey. AMY GOODMAN: What about the warnings, Professor Çaliskan, the warnings that had come in a few weeks ago of something like 30 or so ISIS fighters coming over the border from Syria? The Turkish government very much understood this, the possibility of an attack during Ramadan, and especially in these last days when people are traveling. KORAY ÇALISKAN: There has been intelligence about it. And, unfortunately, we hear about intelligence regarding what's going to happen in Turkey from either U.S. Embassy or French Embassy or German Embassy. Our government doesn't tell us anything about it. The U.S. told about possibility of bombings and that there has been—there have been close to 30 terrorists entering Turkey, planning attacks. We didn't hear anything from our government. This happened before. The last bombing in Istanbul was in Istiklal Street, very close to Gezi Park. And German Embassy asked German schools to be emptied, told their citizens to not to go to Istiklal Avenue and around it. Less than 24 hours later, we had a bombing in Istiklal Avenue. Our government didn't tell anything, because, first, in their mind, if they warn people, they think that people will think that they are not doing their job properly. But on the contrary, if they warn us, if they take intelligence seriously, we would think that they are doing their job. Right now, no one really thinks that they are doing their job. They are just shouting at journalists, academics, intellectuals, for criticizing them. AMY GOODMAN: I wanted to ask you again about the timing. On Monday, Israeli Prime Minister Benjamin Netanyahu announced a restoration of ties with Turkey, including increased cooperation in oil and gas production. This is what he said. PRIME MINISTER BENJAMIN NETANYAHU:[translated] Israel has reached an agreement of a strategic significance to the state of Israel, to security, to regional stability and the Israeli economy. ... The gas field Leviathan can supply both the Egyptian market, which we intend to work with, but Leviathan can also supply the Turkish market and the supply of gas via Turkey to Europe. This is a strategic matter for the state of Israel. This matter could not have been advanced without this agreement, and now we will take action to advance it. AMY GOODMAN: You have the re-establishment of ties between Turkey and Israel this week, and also Turkey seeing an uptick in bombings since last year, when the United States started using Turkey's Incirlik Air Base to carry out bombing raids in Syria. Well, on Tuesday, Secretary of State John Kerry spoke after the deadly attack on the airport in Istanbul. SECRETARY OF STATE JOHN KERRY: We are still collecting information and trying to ascertain what happened and who did it. And I won't comment further on it, except to say that this is daily fare. And that's why I say the first challenge we need to face is countering nonstate violent actors, for a host of reasons. AMY GOODMAN: Professor Çaliskan, can you respond to both Kerry and also the re-establishment of ties with Israel, if you think these issues are related? KORAY ÇALISKAN: I don't think the bombing in Istanbul is related to Turkey's establishing of the diplomatic relations with Israel and Kerry's comments, for two reasons. First, you can't—you don't have time to respond that fast, if you're a terrorist organization, two days after Israel and Turkey announced that. Two, in the last 12 months, there have been 17 bombings, Amy, in Turkey. You're talking about one bombing, one terrorist attack, every three weeks. This is another threat. There is a war against Turkey that President Erdogan and the government of Islamist authoritarian AKP do not take seriously. On the issue of rapprochement between Israel and Turkey, I think it is very sad that Turkey stepped back from its principles, its foreign policy principles. They said that they were against the blockade, the embargo of Palestinians, and they legitimized the blockade itself by agreeing to give the aid to Israel so that it can distribute the aid to any Palestinian anytime it wants. They got the money for the families of nine people the Israeli Defense Forces killed in international waters, thus violated international law. And Turkey accepted that they won't be sued in Turkey or they won't be taken to court in international justice system. This is a disgrace. AMY GOODMAN: That was the Israeli military attack on the Mavi Marmara, that was trying attempt to break the blockade of Gaza. KORAY ÇALISKAN: Yes. So, that's why, for two reasons, they are not related. I believe what Erdogan is trying to do is that he realized that he has been making a lot of mistakes. Russian planes were bombing ISIS, and they downed a Russian plane, with no legitimate reason. And they had to apologize from Russia. And in Turkey, they say that they didn't apologize; they just said they were sorry, as if that was a substantive difference. They are planning to pay for the downing of the plane, and they are planning to get the money from Israel. I don't really understand what principles are changing here. On the one hand, they are criticizing the military coup d'état in Egypt; on the other hand, they are willing to make peace with them. On the one hand, they pretend as if they have principles; on the other hand, they do their best to violate those principles. I think they are losing control of foreign and domestic policy because of one reason: Erdogan's dream of becoming a president of a presidential system. AMY GOODMAN: Professor, earlier this year, more than a thousand Turkish academics signed a peace petition. Several of them were jailed. Can you talk about Erdogan government's reaction to dissenting voice and how that relates to the climate of terror in Turkey right now? KORAY ÇALISKAN: Of course. I signed that letter, too. First, it was signed by more than 1,200 academics. When Erdogan called us terrorists or voices of terror, 1,000 more academics signed it. Since then, more than 100 academics lost their jobs. They were fired from public and private universities. Four academics were jailed for more than a month; they are free right now. And many academics are being prosecuted, just because they criticized AKP's handling of Kurdish question. This is another move of Erdogan to silence civil society in the country. He silenced the media. The most important editor-in-chief in the country, Can Dündar, was about to be killed, less than two months ago, after Erdogan targeted him. A fascist just began shooting at him, and the journalist's wife prevented him from taking aim at Can Dündar. So the press is being silenced. The academics are being silenced. How can academics, who have PhDs from states, Europe, Turkey, accept to be terrorists? What Erdogan does is to do what all authoritarians do: If there is—if he is being criticized and if he doesn't agree with academics or journalists, he accuses them of being with terrorists. He has another strategy in addition to that. When you criticize him, he considers it as an insult or libel against the president. I have a court case. My next hearing will be in September. And I—the prosecutor general wants me to be jailed by eight years, three months for writing a tweet criticizing Erdogan. And the tweet didn't even mention his name. So, imagine, there are hundreds of court cases like this. He is winning them. He is making money out of them. People are being in jail. But what we see, unfortunately, is the following: Turkey is leaving democracy, and United States is just watching it. You cannot have a secure world with authoritarian leaders. Remember what happened in Cold War: We were at the brink of a nuclear war. And right now, world democracy is being threatened by poverty, mostly organized by capitalism, and by terrorism, mostly organized by organizations like ISIS. There is only one way to deal with this double threat: democracy now. AMY GOODMAN: Are you afraid to be making comments like that, speaking to us from Istanbul, where you teach? KORAY ÇALISKAN: I'm not afraid, because my job is to tell the truth. I don't tell the truth, I don't do my job. How am I going to explain this to my children and to my students in the future? Am I afraid? I think right now intellectuals in Turkey are not afraid. They are concerned about their colleagues. They are concerned about Turkish democracy. But we will continue to tell the story of democracy, freedom, equality and liberty. AMY GOODMAN: Koray Çaliskan, associate professor of political science at Bogaziçi University in Istanbul, Turkey. We were speaking to him at his home.